"The Emperor protects!" Nothing like a visit to the dark future that lies ahead. 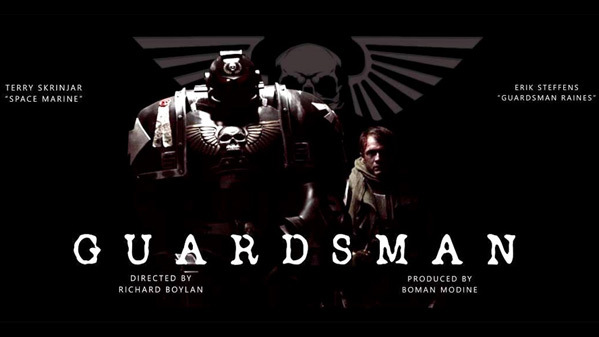 Guardsman is a fan-made short film based on the Warhammer 40,000 game series from Games Workshop. This very, very dark short is about a trooper named Guardsman Raines who ends up deep inside of enemy territory in an abandoned Imperial guard training facility. If you're a fan of the Warhammer 40K series, you know what to expect - and a Space Marine does show up to help him out. That's when this gets good, real good. Guardsman stars Erik Steffens, with Terry Skrinjar in the armor, and Pete Beaumont as the voice of the Space Marine. This is very short and I do wish there was more to it, but it's impressive they made it without much to work with. Thanks to io9 for the tip. Description: "After falling through the collapsed ceiling of an abandoned Imperial guard training facility, Guardsman Raines wakes to find himself alone and separated from his squad deep in heart of enemy territory." Guardsman is directed by filmmaker Richard Boylan, follow him @RichBoylan. Written by Boman Modine; from a story by Boman Modine & Richard Boylan. With cinematography by Sara Garth, and special custom designed armor by Terry Skrinjar (see more of his work on his Facebook). The film was partially funded by Boylan's Patreon. This fan film is unofficial and in no way endorsed by Games Workshop. For more on the short, visit the film's Facebook page. To see more shorts, click here. Thoughts?